After a summer of running around the yard, sunbaking, and dry air soil can become highly compacted. Summer isn’t quite over, but it’s already time to start planning your fall lawn care routine. After the dry heat of summer and plenty of outdoor play, your lawn needs some extra TLC to ensure that it comes back healthy and green next spring. Adding aeration to your fall lawn care routine is an important maintenance step that can’t be overlooked. Aeration helps to fix any soil compaction and remove heavy thatch along with a variety of other benefits. Thatch is the layer of dead grass that builds up in a layer on top of your lawn. In general, thatch is useful for helping prevent sun damage and providing nutrients to your lawn. However, when thatch gets too thick and stops decomposing it can actually prevent your lawn from getting enough water and rob it of nutrients and enough sunlight. Core aeration mitigates the problems by binging microorganisms from the soil up to the thatch to aid in decomposition. After a summer of running around the yard, sunbaking, and dry air soil can become highly compacted. This makes it hard for your lawn to survive as water, airflow, and fertilizer all become unable to penetrate. Aeration decreases soil density and allows for any compaction issues to be a thing of the past. Your lawn should always be treated with fertilizer before winter frosts set in, paired with aeration you’ll be giving your lawn an advantage over the upcoming weather. Aerating should always be done before fertilizer is applied, as it allows for more even and effective distribution of nutrients. Last but not least, aeration improves the overall health of your lawn in general. It allows the root systems of your lawn the access to better air flow, water absorption, and nutrients it needs to grow strong and healthy. All of this allows the roots to grow deeper and stronger, meaning your lawn will look greener and be healthier without you even trying. 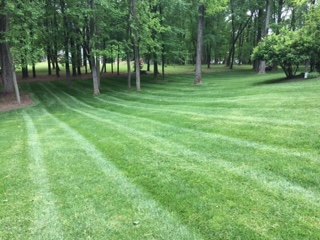 For the past ten years, Edwards Lawn and Home, located in Linthicum Heights, MD has been offering premier residential and services to improve your property all year long. The options are endless from a new patio to a backyard fire pit, let the winners of Angie’s List Super Service Award serve you! If you’re interested in finding out more about our services or getting a quote, you can contact us online or give us a call at 443-341-6539. For more information about our services or DIY tips and tricks follow us on Facebook, Twitter, Google+, LinkedIn, YouTubeand Houzz. This entry was posted on Friday, August 10th, 2018 at 3:46 pm. Both comments and pings are currently closed.